Last week Andy and I traveled down the coast from Florance, OR to Monterey, CA then back up through the valleys. Along the way there was many great opportunities for photos. Day 1: We drove down I-5 and crossed over the coastal range by Eugene, OR. This spit us out at Florance. Then following 101, we headed south where we spent the night in Coos Bay. Since Coos Bay had pretty much nothing in the way of good food, we decided to try our luck in Bandon, just south. 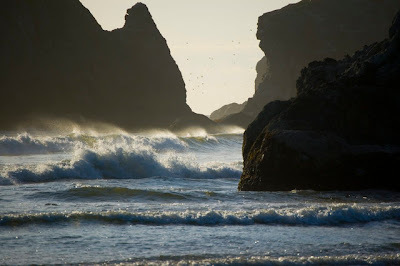 Alas, good food eluded us, but after an abysmal meal we checked out the beach at Bandon. This is one of the shots from that venture.